Boxer Amir Khan has landed in Pakistan after promising to help the victims of the army school attack in Peshawar. The Bolton fighter, whose parents were born in Pakistan, has already donated a pair of shorts worth £30,000 to help pay for the school to be rebuilt. Posting on Instagram, Khan said: "Landed in Pakistan. Have my police security in front and behind my car." Pakistani Taliban militants killed 141 people. 132 of them children, in the attack on 16 December. Speaking upon his arrival in the country, Khan added: "My deepest condolences go out to all the affected families and I wish to express my full support for Pakistan and the people of Pakistan." The 28-year-old boxer, who fights at welterweight, said he was willing to help rebuild the damaged school and "fight the menace of terrorism". "I want to show the world that we can improve Pakistan," he added. "I'm here in this time to stand with the Pakistani nation. I've come here to prove that Pakistan is a safe country for sports. I also want to give the message that sports and education will take us forward." 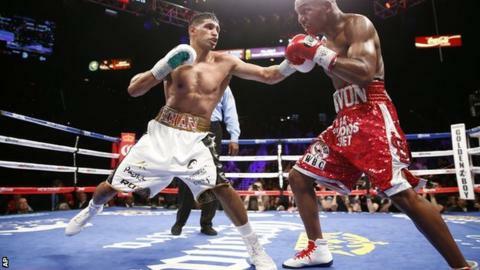 Khan wore the £30,000 shorts, which have a waistband made from 24-carat gold threading, in his points win against American Devon Alexander earlier in December.